Berserk Season 1 contains episodes 1-12. Peer into the dark once more—the Black Swordsman roars again! 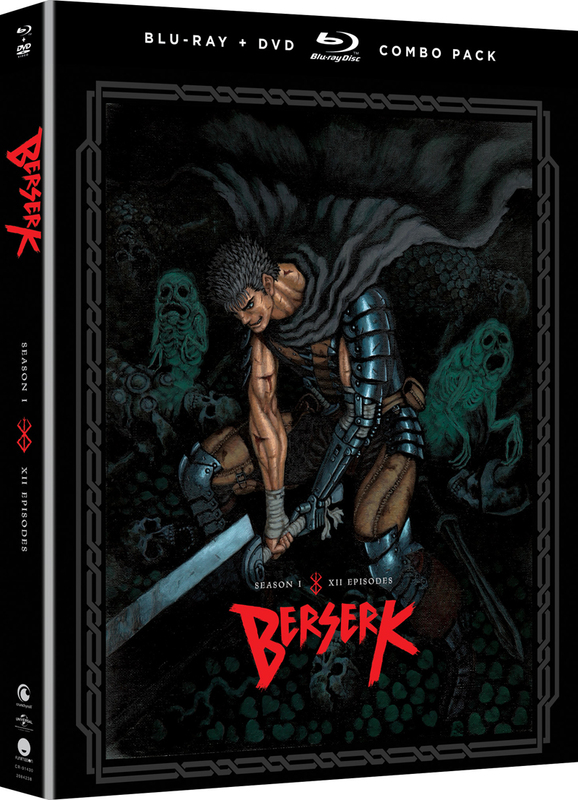 Branded for death and hunted by demons forevermore, Guts embarks on a journey to escape his fate and get his revenge on the man he once considered a friend. With his monstrous blade, Dragonslayer, he and a band of unlikely allies will face danger unlike any they’ve ever experienced before. The answers he seeks lie shrouded in the night. Special Features: Promo Videos, Textless Opening & Closing Songs, and Trailers. Berserk is a great action-packed hackin slash anime, with a ok story. The animation got clean up a lot compared to when it was released on Crunchyroll and everybody was hating on the animation. Usually due to a strict time scheduling they have to cut corners when they’re releasing it for airing on television in Japan. If you’re a devoted fan to the berserker series I highly recommend in getting this series for your collection. A welcomed and enjoyed continuation. This show takes us to much more demonic, graphic, and explicit content. Be warned that much of this was removed for CR but is shown in this release. Of the controversy, Miura's work is highly detailed horror. 3D animation allows for fewer corners to be cut. It's a stylistic and production choice you just have to accept, just like the freeze frames, stilted low quality fight scenes, and gratuitous use of camera pans in the '97 anime were accepted. Aside from the above, the show is excellent. The dub is good. I enjoyed the music. The fights are much more interesting, and I LOVE the sound design. Guts' sword is like no other, and it SOUNDS like no other now. They made every step he takes heavy and unique within the show. It's a detail I appreciated. If you are new and interested, I suggest you start with the three recent movies, as this show continues the story from where they left off.